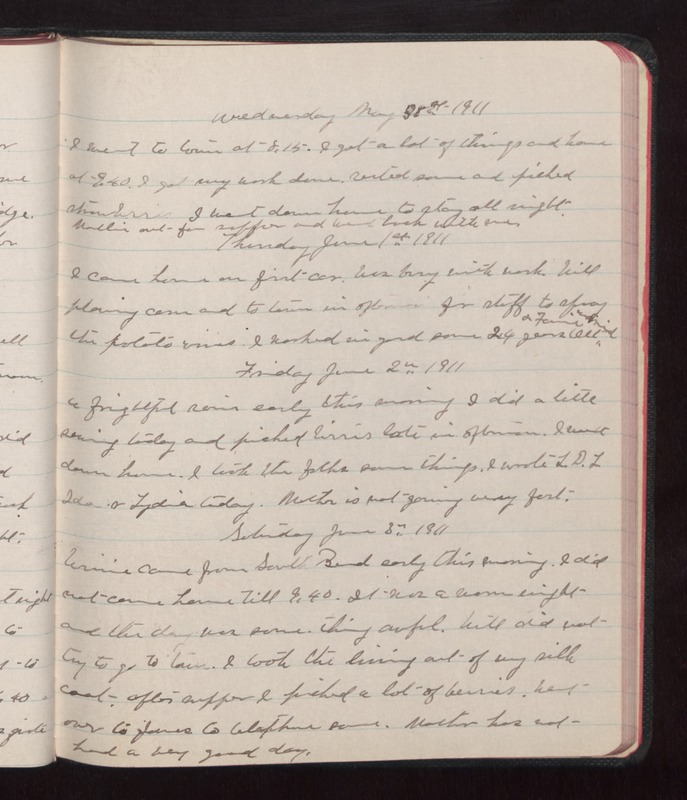 Wednesday May 31 1911 I went to town at 8.15. I got a lot of things and home at 9.40. I got my work done. Rested some and picked strawberries I went down home to stay all night. Mollie out for supper and went back with me. Thursday June 1st 1911 I came home on first car. Was busy with work. Will plowing corn and to town in afternoon for stuff to spray the potato vies. I worked in yard some 25 years Ott & Fannie married Friday June 2 1911 A frightful rain early this morning I did a little sewing today and picked berries late in the afternoon. I went down home. I took the folks some things. I wrote L.D.L. Ida & Lydia today. Mother is not gaining very fast. Saturday June 3 1911 Winnie came from South Bend early this morning. I did not come home till 9.40. It was a warm night and the day was something awful. Will did not try to get to town. I took the lining out of my silk coat. After supper I picked a lot of berries. Went over to Jones to telephone some. Mother has not had a very good day.